Cheeks v. Freeport Pancake House Inc. was a case that completely changed the way in which two parties can settle a claim pursuant to the Fair Labor Standards Act. 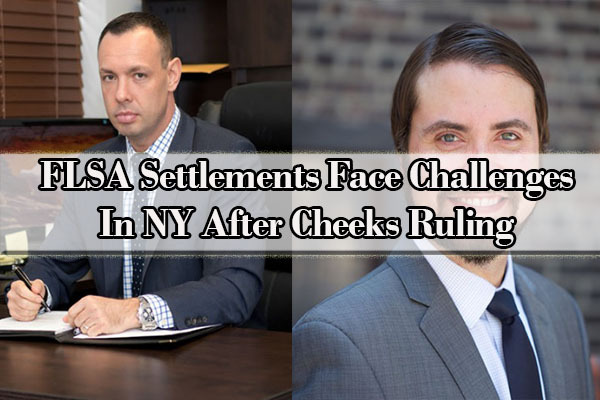 Cheeks arose after an individual plaintiff settled an FLSA wage claim with defendants and filed a stipulation seeking to dismiss all claims with prejudice under Rule 41(a) of the Federal Rules of Civil Procedure. While this used to be standard procedure in FLSA cases, the district court rejected the dismissal and instead found that all FLSA settlements now had to be reviewed and approved by the court. The plaintiff appealed, and the Second Circuit affirmed, also finding that the FLSA mandated the court’s review of all FLSA settlements to be enforceable. More specifically, in Cheeks, the Second Circuit held that where a plaintiff had already filed a lawsuit under the FLSA, the plaintiff could not privately agree to release his or her FLSA claims and stipulate to their dismissal with prejudice under FRCP 41(a). This 2015 ruling actually prompted more questions than it answered. One question that inevitably arose following the Cheeks decision was whether a prelitigation FLSA settlement agreement requires the same approval by the court or the U.S. Department of Labor. In 2017, the Southern District of New York held that a prelitigation settlement agreement releasing an employer “from any and all claims and rights of any nature whatsoever” is fully enforceable even without being approved by a court or the DOL. The court found that Cheeks applies “only to settlement agreements that occur within the context of [FRCP] 41,” which does not apply to settlements “entered into entirely outside the litigation context, like the agreement at issue here.” In other words, FRCP 41 applies only to settlements reached while a case is pending, not when an FLSA claim is settled before any legal action was initiated. The court therefore upheld the parties’ private prelitigation settlement agreement. To hold otherwise “would effectively require that any parties, even ably counseled plaintiffs, wishing to settle an FLSA dispute out of court without bringing suit, obtain judicial or agency approval for their settlement. Another question that predictably arose from the Cheeks decision was whether parties can settle FLSA claims without court approval if the settlement is made pursuant to FRCP 68, rather than FRCP 41(a). FRCP 68 presented a potential loophole through which FLSA claims could be settled with prejudice and without any court approval. Under FRCP 68, a party defending a claim can make an “offer of judgment” to the other party. If the other party accepts the offer, the clerk of the court must enter judgment pursuant to the offer’s terms. In the event the offered party rejects the offer and obtains a less favorable judgment at trial, that party must then pay the costs incurred by the offering party after the offer was made. Therefore, because Cheeks was decided in the context of a FRCP 41(a) dismissal and did not involve or even mention FRCP 68, litigants have increasingly tried to evade the Cheeks review by settling FLSA cases pursuant to FRCP 68 and arguing that Cheeks is applicable to FRCP 68 settlements. However, there has been a split in the district courts, with some ruling that Rule 68 FLSA settlements are not valid absent court or DOL approval, while others finding that a Rule 68 settlement of an FLSA case is not subject to court approval. As such, on April 10, 2017, due to the fact that the Second Circuit had not yet addressed this FRCP 68 issue, the Southern District of New York certified it for interlocutory appeal to the Second Circuit, stating that “in light of the split among the district courts, resolution by the Second Circuit is plainly desirable, if not necessary. ” While still not decided on the merits, on Oct. 23, 2017, the Second Circuit agreed to consider whether accepted FRCP 68 “offers of judgment” in FLSA cases need court approval to be binding. Lastly, but most importantly, as a result of the Cheeks mandated court review, courts in the Second Circuit have begun to routinely reject, and refuse to approve of, FLSA settlement agreements that contain terms once considered boilerplate and included in most FLSA settlement agreements. Prior to Cheeks, general releases, no-reemployment provisions, confidentiality clauses and nondisparagement clauses were routinely included in these agreements. FLSA settlements that seek to prevent a plaintiff from having future employment with the defendant. Further, New York courts have declined to award attorneys’ fees constituting more than one-third of the total settlement amount and have consistently reduced attorneys’ hourly rates. For example, in Mardechayev v. Just Four Wheels, a recent case that our firm handled, the Eastern District of New York refused to approve an FLSA settlement agreement due to a lack of reciprocity of parties in the release. The court found that the release did not have complete reciprocity because the plaintiff was releasing claims against not only the named defendants, but also against a broad array of the defendants’ connections, while the named defendants were only required to release the plaintiff. Also, in the same case, the Eastern District of New York would only approve of the settlement agreement after the terms were changed to reflect that the expenses/costs would be deducted from the total settlement prior to taking our attorneys’ fees and not deducted from the client’s portion of the settlement payment. In Camas v. Tutto Bene Restaurant, this time in the Southern District of New York, the court would not approve of an FLSA settlement agreement because the release was too broad in that it released the defendants from all claims (including claims unrelated to the FLSA), rather than only releasing the defendants from all FLSA claims related to the plaintiff’s employment. In sum, if you work within the Second Circuit (New York, Connecticut and Vermont) and want the court to approve your FLSA settlement agreement with your (former) employer, you must make sure: (1) the release provision is not overbroad, is reciprocal, and is only limited to FLSA claims; (2) the agreement does not contain a confidentiality provision unless there is also a carveout for truthful statements about the defendant’s failure to pay proper wages; and (3) the attorneys’ fees do not constitute more than one-third of the total settlement amount. It will be extremely interesting to watch not only how the Second Circuit rules on the FRCP 68 issue, but to also see if there are any other settlement agreement provisions that the court decides to reject as violating the spirit of the FLSA. Alex Umansky is a partner and Jeffrey Rosenberg is senior litigation counsel at the Law Office of Yuriy Moshes PC. Disclosure: Yuriy Moshes PC represented the plaintiffs in Mardechayev v. Just Four Wheels Inc. and Camas v. Tutto Bene Restaurant.